The research paper, to be presented at one of the world's most important conferences on human-computer interfaces, will introduce the term 'shape resolution' and its ten features, to describe the resolution of an interactive device: in addition to display and touch resolution. 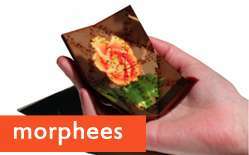 The team believe Morphees will be the next generation of mobile devices, where users can download applications that embed a dedicated form factor, for instance the "stress ball app" that collapses the device in on itself or the "game app" that makes it adopt a console-like shape. Dr Anne Roudaut, Research Assistant in the Department of Computer Science's Bristol Interaction and Graphics group, said: "The interesting thing about our work is that we are a step towards enabling our mobile devices to change shape on-demand. Imagine downloading a game application on the app-store and that the mobile phone would shape-shift into a console-like shape in order to help the device to be grasped properly. The device could also transform into a sphere to serve as a stress ball, or bend itself to hide the screen when a password is being typed so passers-by can't see private information."